Al Qassimi: The volume of participation reflects the growing importance of Sharjah for international brands and companies that seek to grow their businesses and enhance their presence in the region. Al Owais: The three exhibitions have received increasing interest from international companies and have become a platform for business people in the region to see the latest equipment and technologies that support their areas of work. Al Midfa: The three exhibitions offer the latest technological innovations of companies and their latest products and solutions from around the world. H.E. Sheikh Khalid toured the three exhibitions, which succeeded in attracting more than 120 companies, factories and trademarks from 11 countries. The exhibitions will be held until the 14th of December with the support of Sharjah Chamber of Commerce and Industry (SCCI). During his tour, H.E. Sheikh Khalid met with a number of exhibitors, who briefed him on the latest products, machines, programs, technological innovations and raw materials used in various fields related to the manufacturing of molds, plastics, printing, packaging and paper. During his visit, H.E. Sheikh Khalid Bin Abdullah Bin Sultan Al Qassimi was accompanied by H.E. Abdullah Sultan Al Owais, Chairman of SCCI and Chairman of Expo Centre Sharjah, and a number of members from the Chamber's Board of Directors, along with H.E. Saif Mohammed Al Midfa, CEO of Expo Centre Sharjah. The opening ceremony was also attended by officials, official figures, members of the diplomatic corps, representatives of different sector groups operating under the umbrella of Sharjah Chamber and interested traders. H.E. Sheikh Khalid Bin Abdullah Bin Sultan Al Qassimi praised the success of Expo Centre Sharjah in providing a new and distinctive edition of these exhibitions with high levels of organization and quality of services to visitors and exhibitors. He added that this reflects the eagerness of the Centre's management to enhance Sharjah's reputation, as a leading regional and global economic hub, help conducting business for various economic sectors, which have been achieved by hosting and organizing events of high importance to local and regional business communities. H.E. 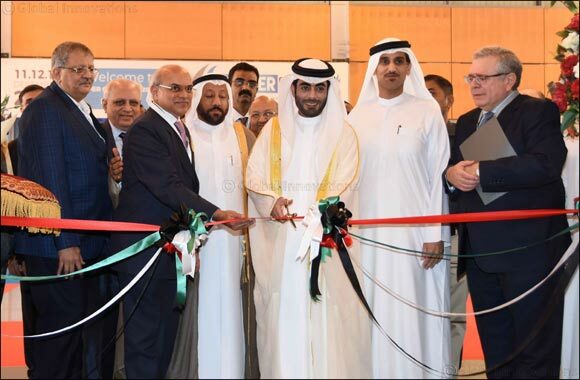 Abdullah Sultan Al Owais, Chairman of SCCI and Chairman of Expo Centre Sharjah, thanked H.E. Sheikh Khalid Bin Abdullah Bin Sultan Al Qassimi for inaugurating the three exhibitions, which received increasing attention from specialized international companies from around the world since their inception. He added that this attention was due to the exhibitions acting as a platform for traders and businesspeople from different countries in the region who want to learn about the latest equipment, technologies, devices and programs that support their areas of work and their industries. He also added that the exhibitions offer opportunities to make deals, build partnerships and establish business dealings. Al Owais said that “Print Pack Arabia” is the first international exhibition in the region that is specialized in the printing, packaging and paper industries. He added that the exhibition is considered the most important platform for factories, companies, suppliers and traders and the most popular event for the exchange of knowledge that can be relied upon in the development of regional industries, especially after the success of its two previous editions in gaining confidence of exhibitors in the field. He added that this success is also due launching the exhibition in conjunction with the 'Plastivision Arabia' and 'Arabiamold' exhibitions, which enhances its status as a major commercial multi-industry event. Al Owais added that the importance of Print Pack Arabia comes at a time when the UAE occupies a strong regional position in the field of end-user sectors such as industrial packaging, food and health care. He added that the rapid preparations and arrangements for the “Expo 2020” Exhibition are among the most important factors contributing to the growth of the industry, the expansion of retail trade, the increase in the demand for food, beverages and other consumer goods, and the increase in population and incomes. The Chairman of Sharjah Chamber noted that the exhibition benefited from its partnership with India on the printing exhibition. The event, which specialized in packaging and manufacturing machines, benefited from the existing partnership with the Indian Printing, Packaging and Allied Machinery Manufacturers' Association (IPAMA). He pointed out that the Expo Centre Sharjah worked to develop this partnership through organizing the exhibition, which contributed to the attainment of vast achievements not only for the exhibition, but on a regional level as well.